Height: 10cm - Volume: 250ml. 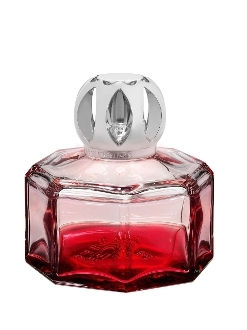 Description: A geometric shape combined with red lacquer which subtly decorates the bottom of the catalytic lamp and reflects on the edges of the glass. This precious bottle is topped with an elegant sphere mounting in shiny silver. Product benefit: Presented in a very pretty boxed set and protected by its pouch, this fragrance diffuser is an ideal gift and is equally beautiful and practical. Expert tip: Choose your Lampe Berger Home Fragrance from a selection of over 50 fragrances. Lamp sold in a boxed set with accessories: wick-burner, silver round mounting, snuffer and funnel.